Few moments are freighted with as much possibility and risk as the moment of personal invitation. Think about it. A guy decides to personally invite the girl he recently met to get a cup of coffee or to dinner and a movie. Risky? You bet. She may say, “no thanks.” Filled with possibility? Of course. It may mark the beginning of a relationship that lasts a lifetime. A leader personally invites you to accept a key position on the new team. Risky? Certainly. There is no guarantee the fit will be a good one. Filled with possibility? Sure. It may develop into a mutually profitable relationship that lasts years. 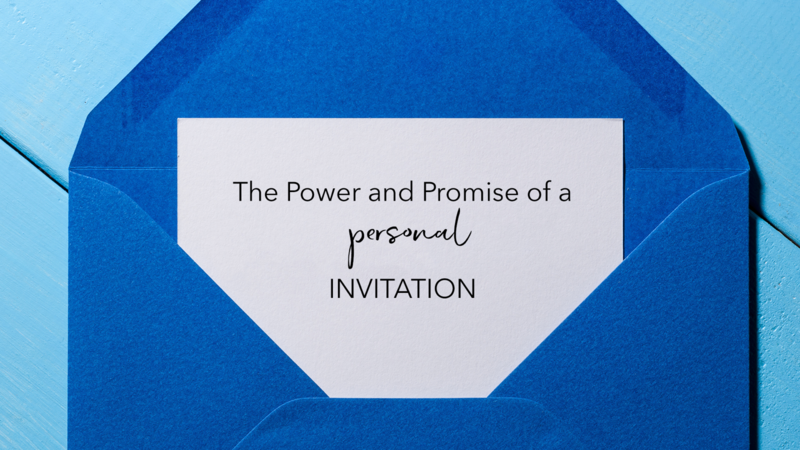 The reason the moment of personal invitation is so powerful is because of the “personal” component. Non-personal invitations come to us in a steady stream through all sorts of media. Virtually all advertisements make some sort of “ask” or offer some type of “invitation.” Some are effective, some not so much. These invitations have become like background noise in our lives. Yet, the equation changes significantly when one individual personally invites another individual. Risky? To be sure. Filled with possibility? Yes, incredibly so. Now think with me about the gospel and about church. It’s one thing to get a mailer, or see a yard sign, or get an e-mail blast, or see a Facebook post, or read a tweet, or hear something on the radio, or watch something on TV. It’s entirely of a different order if someone I know and already have some relationship with invites me personally. Yes, there is always some risk. But the possibilities . . . they could be life changing. Please personally invite someone to join you at Ingleside this Easter.